A dream trip took an unexpected turn when I decided to follow the path less travelled. Waking up at 5:30am, my day was wide open. 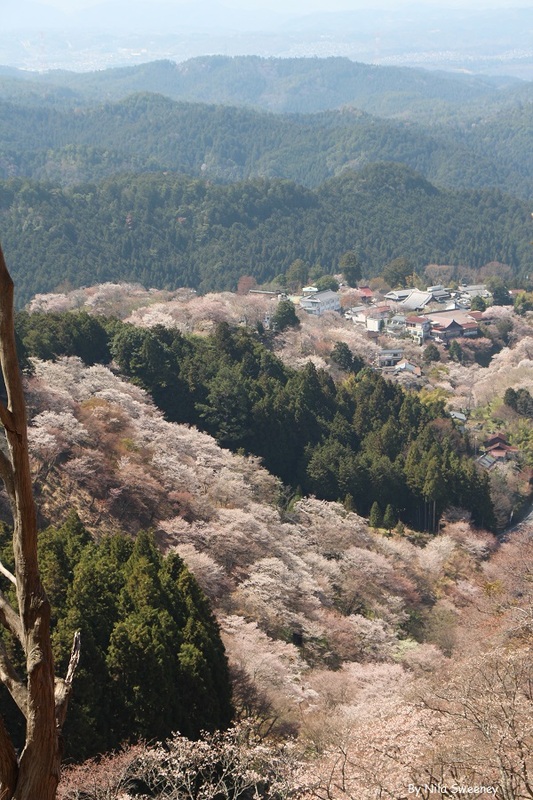 So many temples to see, so many cherry blossoms to view. What shall I do today, I asked myself as I checked the weather forecast. I wanted to make a quick plan on how to tackle Kyoto today. Apparently, one doesn’t just show up in Kyoto. Over breakfast of two very thick slices of white bread and a sad-looking fried egg, I brainstormed with my roommates; a German girl named Meike and a French girl whose name I didn’t quite catch. I thought about going to the bamboo forest, which was about 45 minutes from Kyoto, but then I remembered the crowd I encountered the day before. Do I really want to bump into so many pushing and shoving tourists today? The thought of it made me recoil a bit. 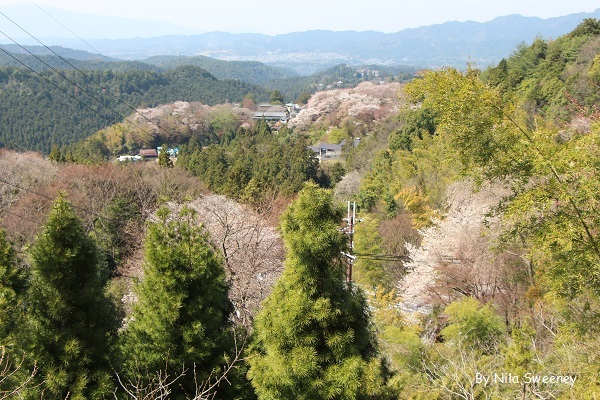 There was another option: Mount Yoshino, which boasts 30,000 cherry blossoms - the ultimate destination for a cherry blossom junkie like me. It was a no-brainer. 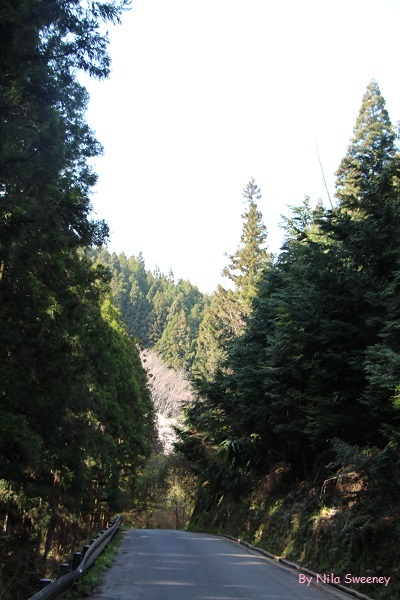 The two-hour train ride to get to Mount Yoshino was quite pleasant. The announcements were all in Japanese, but I understood a lot of the words and the accent, so I knew when my train stop was coming next. It was nice to leave the mob behind. 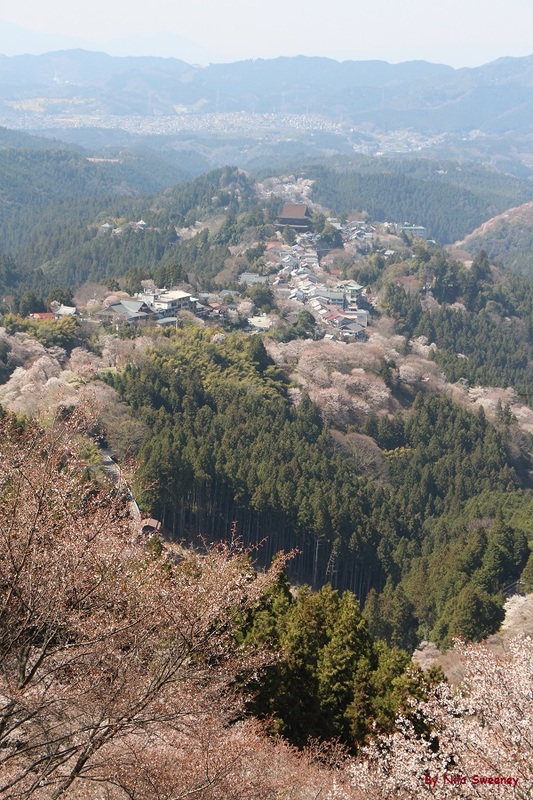 As soon as I arrived in Mount Yoshino, I took the bus halfway up the mountain to give me a head start. It was all uphill, but what a view! 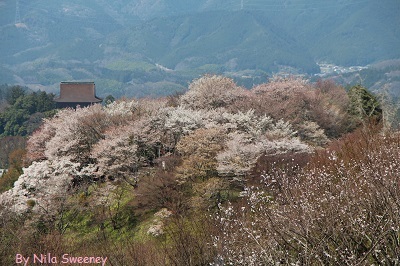 The sight of the thousands of cherry blossoms clustered along the top of the mountain was simply stunning. Funnily, they look like a bald patch from afar. There were some tourists too, but nowhere near as many as Kyoto so there was no chance of elbowing someone off their place so you can take that perfect shot. I lingered at the mountain top for another half hour and then decided to make my way down when the heat got too much. It was a bright and sunny day. 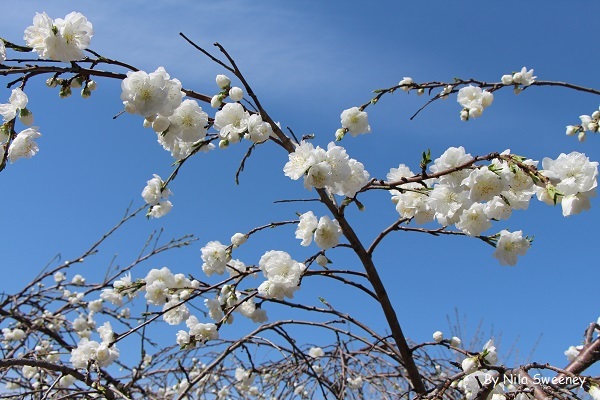 Just the perfect day to be in Yoshino. I could hear the bus announcer from a distance, so I thought I'd just follow the sound. However, my curiosity got the better of me so I followed a different route and I ended up in the main village. 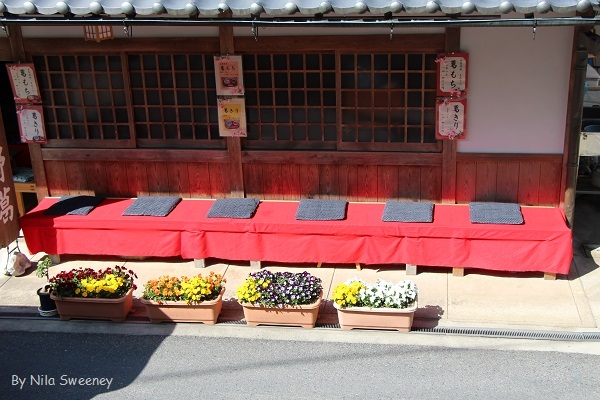 It wasn't a wasted effort because the village itself was fascinating. I wandered around for a few minutes before asking an elderly gentleman for direction to the nearest bus stop. While the helpful gentleman was giving me directions, I saw from the corner of my eyes that the train station was 4.6 km away. I asked him if there was a shortcut to the bus station. He said yes, and pointed me to a road going downhill. It looked right so I followed it. After walking uphill over the past hour and half, I was ready to take the easier way down. My legs were starting to fatigue at this point. When I first started my trek down the mountain, there were a lot of people walking in the same direction. Then, they became fewer until I was the only one walking down the isolated road. I looked around but there was no one else. It was eerily quiet. I wasn’t worried during the first 2 km. 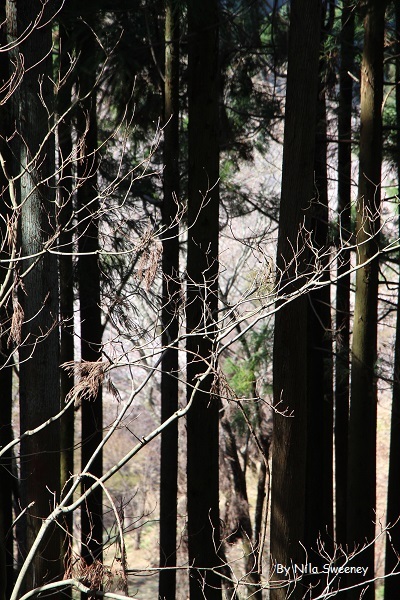 The scenery was so captivating I forgot that I was on my own in the middle of Yoshino. However, after walking alone for an hour, I started to wonder if I was lost. My eyes also started playing tricks on me at this stage. At one point I thought I saw the top of a bus, only to find out it was actually an abandoned building. I started to worry a little, and contemplated calling my friend Tomoko to send in a rescue party. I quickly checked if my phone has reception. Nothing. Oh dear. Then, out of nowhere, an old woman, probably in her late 60s, appeared behind me, and walked briskly past me. Where did she come from? I didn't hear anyone walking behind me. I nervously looked around to see if there were others. None. I tried to catch up with her and asked if I was in the right direction to the bus station. She just laughed. She told me in Japanese that I’d just have to keep walking. Then I lost her. At this point I was really worried. Was she for real or was I just imagining her? I walked faster, almost running down the mountain as the sun started to set. I desperately wanted to see a lot of people. Then I chuckled at the irony of that thought as I started to sprint. To my relief, the sign I was looking for appeared just around the bend: the train station! I was so happy to finally get back to civilisation. I’ve never been happier to see so many people again. I jumped into the first train back to Kyoto, even if I have to pay another $10 for the ticket. As I sat on the train, I was quietly laughing at my adventures today. I wanted to escape the crowd and got my wish. I also got to see one of the most breath-taking sights I've seen so far in Japan. What else could I ask for?